You've always danced to the beat of your own drum. When it comes to fashion, you're drawn to more-eclectic pieces. 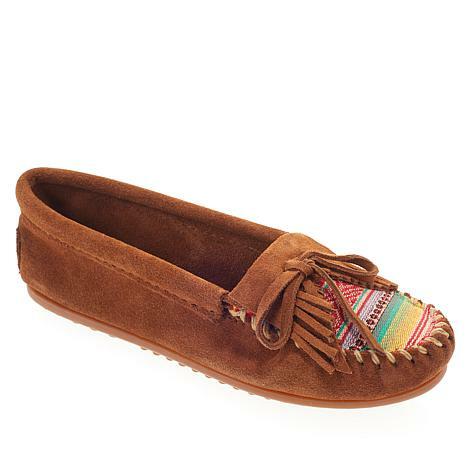 Minnetonka speaks to your free-spirited style with these beautiful moccasins featuring woven textile at the toe for added interest. 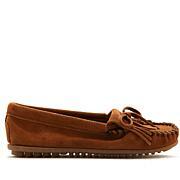 Great mocs! Bought these in natural shade. Regular size 8, fit just fine. Need more patterns in Minnetonkas! Thank you! This would be the perfect shoe if the stitching were finished across the inside top of the shoe. The stitching presses into the top of my feet causing pain. I'll try using bandaids or something to cushion the area. 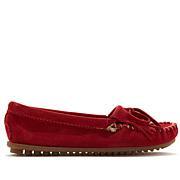 Maybe sewing suede across the inside stitching would pad that area for us tenderfoots. I will figure it out because I really like these shoes!! I've worn Minnetonka moccasins for years and always order 1/2 size down from my regular size since they will stretch a little bit and form to my feet. I wear a size 10 and ordered a size 9.5 in the Stone color and they flopped around on my feet. They felt more like a 10.5 than a 9.5 and they bulged out the sides when walking. The structure didn't feel as solid as my older Minnetonka moccasins. Returned.